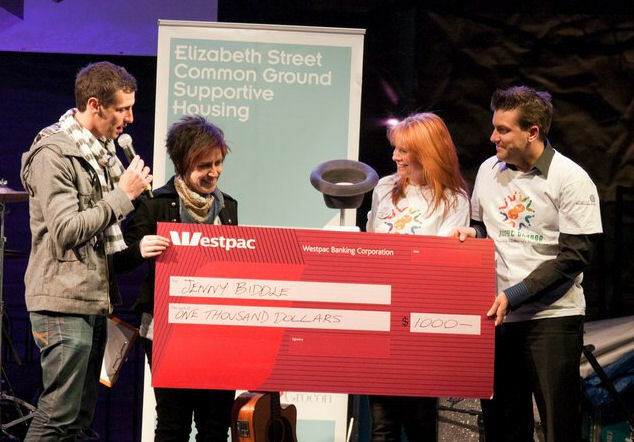 With the help of supportive fans, Jenny Biddle took home the title of “Melbourne’s Best Busker” as crowds went nuts with generosity. I popped into the recording studio yesterday, and was incredibly inspired. It’s been a while since I’ve been in the studio (almost 2 years since the recording of Chest of Drawers), and I didn’t realise how much I missed it. /wp-content/uploads/2017/08/jenny-biddle-logo-17.png 0 0 admin /wp-content/uploads/2017/08/jenny-biddle-logo-17.png admin2011-02-25 14:44:142011-02-25 14:44:14We have launched our website! Wow the Tamworth Country Music Festival is as amazing as the say it is. So much music, things to do, buskers, diversity, rodeo, food, music music music. With my boots, flanny, cow-girl hat, I am all ready for the Tamworth Country Music Festival (although I don’t look quite as hot as McLeod’s Daughters, but will attempt to fit in). VERY exciting. Can’t say I’ve ever been before, but SHOULD have! Here we are.